Function venue near Bristol and Bath. 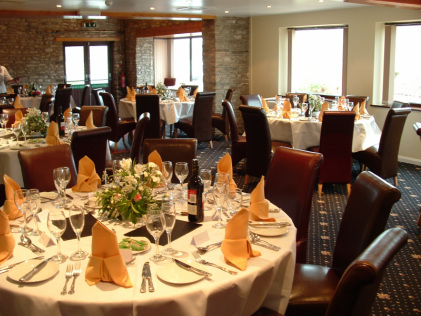 The main function room at Cameley Lodge will comfortably seat 100 guests for a variety of functions from anniversary to Rotary dinners and corporate events. A variety of menus are always available from banquets to formal dinners, hot buffets to barbeques. With splendid views overlooking beautiful English countryside, the natural setting will compliment your special occasion. The Dining room can accommodate up to 40 guests seated. The bar which adjoins both function rooms can also be used as a reception area for your guests prior to dining. It is fully stocked with major brands, draught beers and boasts a comprehensive wine list.